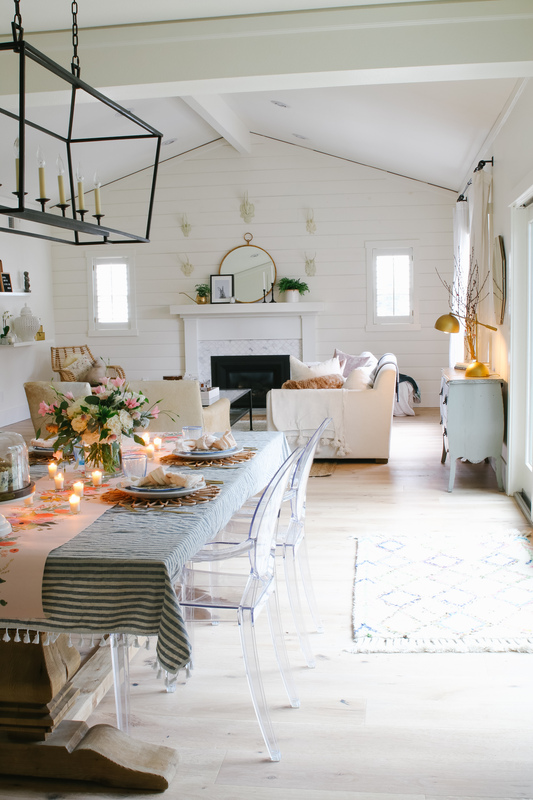 Hi and welcome to my boho farmhouse spring home! 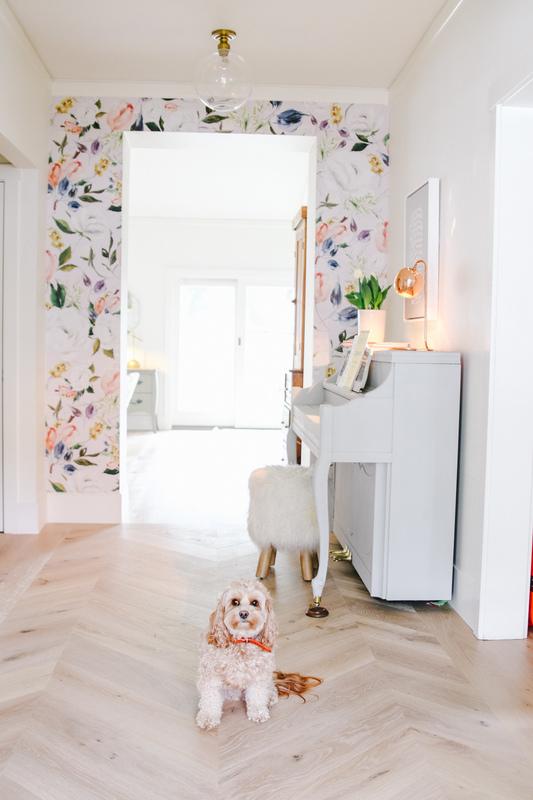 Check out these spring decorating ideas and take a peek inside my home! We have had some big things happening around here and I can’t wait to show you around! If you are here from Heather, Southern State of Mind, welcome! I’m excited for you to see all the spring decorating ideas on this fun tour. Be sure to visit all the links at the bottom of this post and pin your favorites so you can easily access them later too! We have been busy updating our home this year. One of the projects we wanted to tackle was a small kitchen remodel. We are planning on updating our cabinets and appliances as well as put in some open shelving. As most remodels go, it has spiraled into getting all new hardwood floors throughout the entire house! 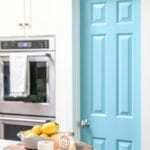 This was something that we had planned on doing eventually but we came to the realization that we should do that first before proceeding with updating the kitchen. We didn’t want to damage the new cabinets when we got to removing the old flooring. We definitely felt like the floors should come first. So, we just got the new floors in and I am so in love with them! It’s amazing what a difference the color of the floors make in your home. Our home was a little dark before, but now the light seems to bounce off every surface and is so light and airy. What a difference it makes in your overall mood. Especially on a gloomy and rainy day! 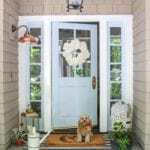 Ok, enough talking, let’s go inside and I’ll show you my boho farmhouse spring home. This is my entryway, the first room that greets guests and gives them a feel for what my home is like. I feel like your entryway should make an impression but also greet your visitors with a warm hug. After all, it’s their first impression and you know how that saying goes. So, these are our new floors! What do you think? We placed the hardwood floor in a herringbone pattern here to give it some interest. 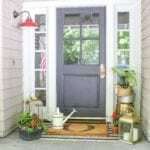 I am really loving the way this looks as you walk through the front door! 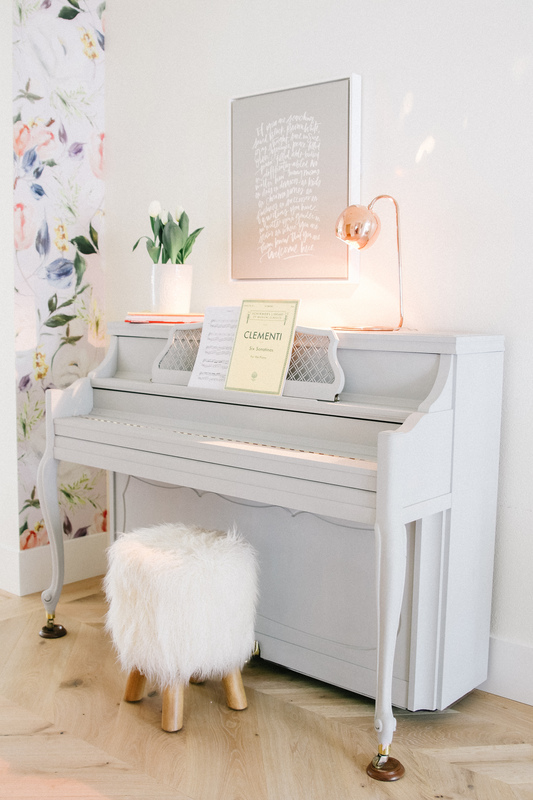 And I just recently painted my piano with Annie Sloane chalk paint in the color Paris Grey. If you follow me on Instagram, you may have seen my stories where I hit a major snafu and tried to paint it pink. Needless to say, it quickly got a new coat of paint in this pretty neutral color! I put up this beautiful removable wallpaper last summer (style is called Irina). I haven’t shared it yet because it didn’t look all that great with the old floors. 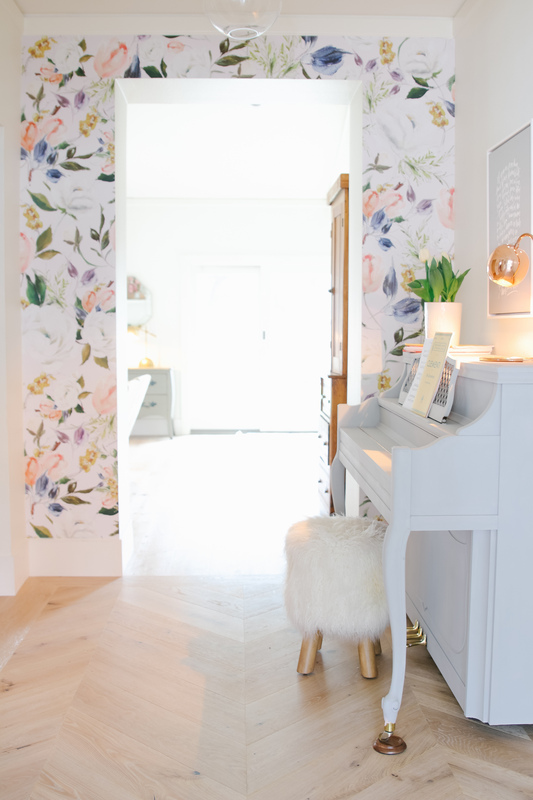 But now it really makes such a statement with the herringbone floors and chalk painted piano! 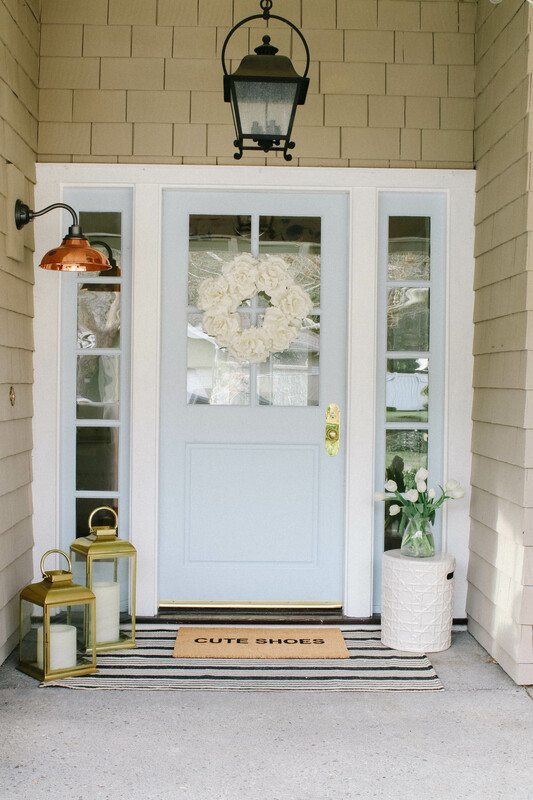 I love this entryway with it’s boho farmhouse spring vibes. 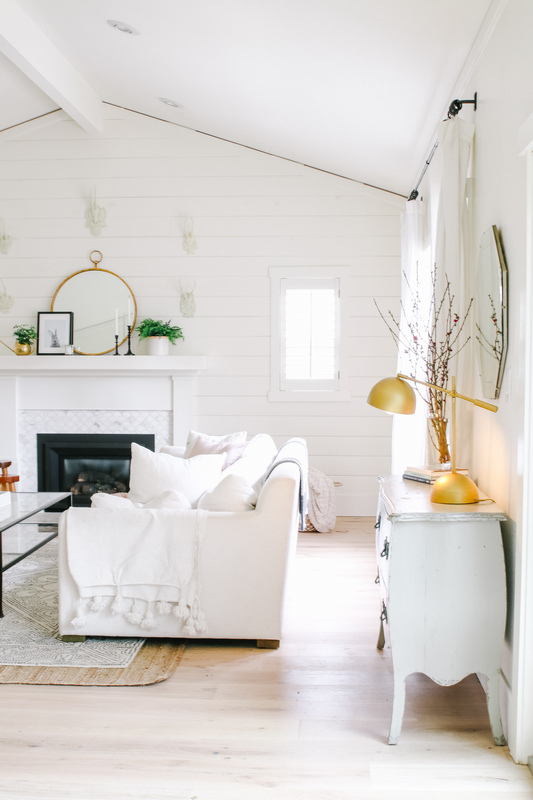 Next up on the spring home tour is my living room. This is where we spend all our time. It is my impromptu office and also where we snuggle up and binge watch Netflix in the evenings. And can I just tell you how obsessed I am with this new lamp?! It’s the Leanne Ford collaboration with Target and I just love the way it looks! With the new floors, I have kept the rest of the furnishings very neutral. Spring is all about fresh new beginnings and I tend to gravitate towards light and airy neutrals this time of year. Whites and blacks with pops of green. My simple spring mantel is a perfect example of that. Check out the post for my $6 DIY Bunny artwork – it’s too cute! 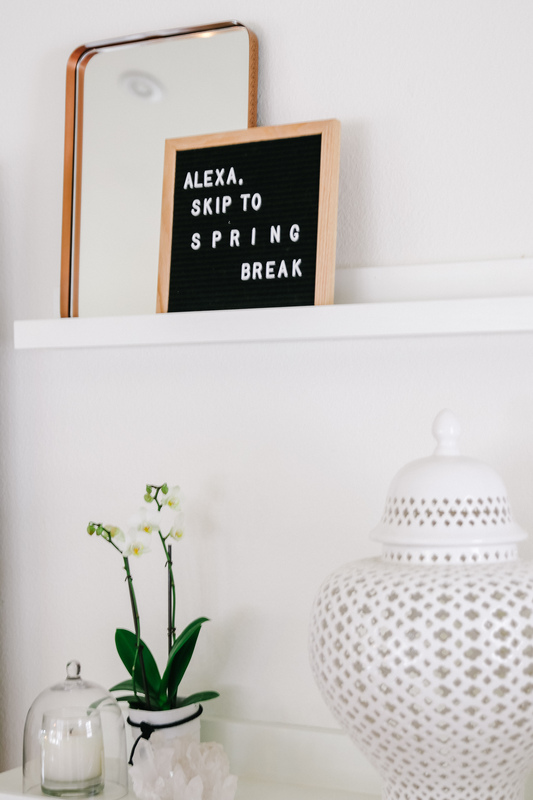 I updated my letter board with a cheeky, springtime quote that perfectly reflects my kids’ mindsets right now! My letterboard is from Retrogramboards and they are offering my readers 15% off with code MG15! So, take advantage and get one for yourself so you can write funny messages too. Such a fun idea to update your decor for spring! 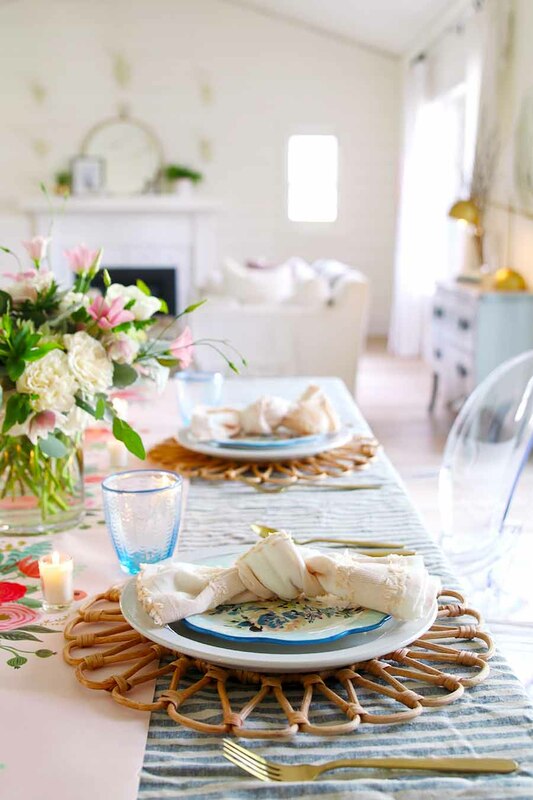 I recently shared this Pink & Blue Spring Table Setting that is perfect for Easter brunch or a simple spring dinner. I love the boho tablecloth with it’s fringe details. Come take a peek! 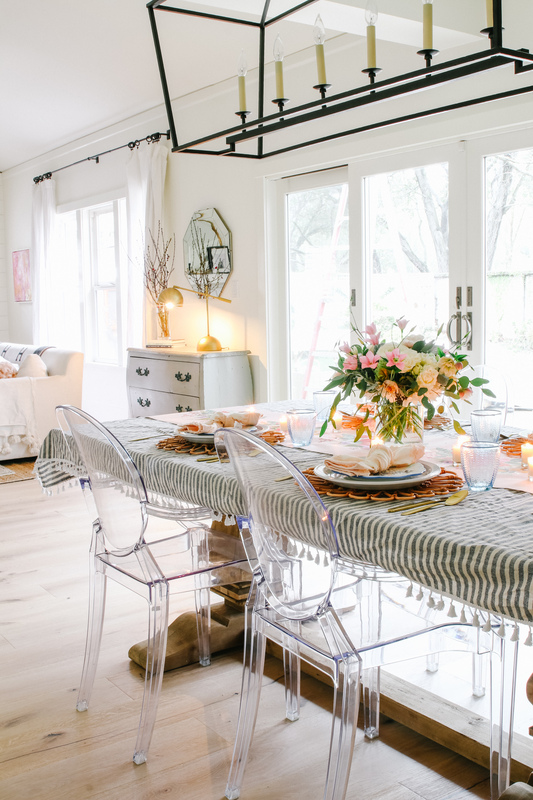 Fresh spring flowers and simple farmhouse details are all that’s needed to create this feminine, yet boho Easter tablescape. You can see all the details HERE. 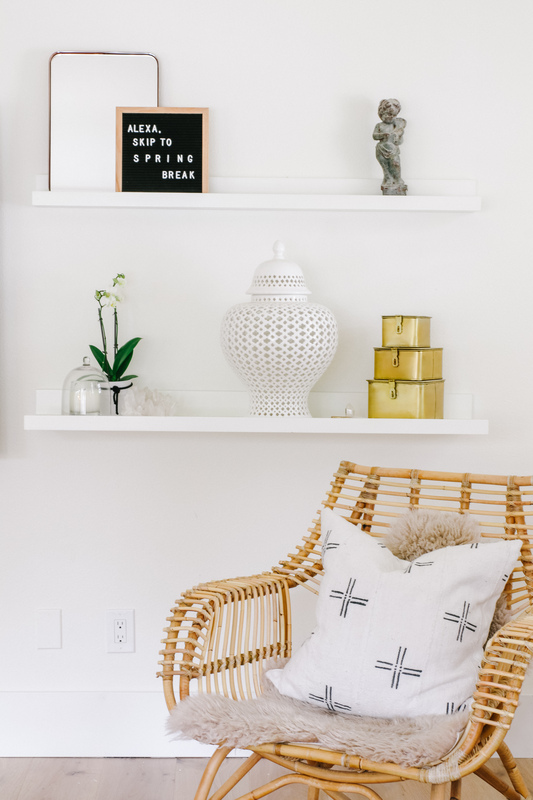 Here are a few simple ideas to decorate your home for spring. Add fresh flowers or cuttings from the yard. Display in your entryway or other areas that guests are sure to notice. Display blossoming branch cuttings in a tall cylinder vase. Trader Joe’s has a great selection of spring branches this time of year for under $10 and they last a long time! Nothing says spring more than blossoming branches. Add some pops of springtime pastels for soft color that won’t have your home feeling like an easter egg. Bring the pots inside. Indoor plants sure do brighten up your home and I love the color combination of white, black and green. Add some candles. Don’t forget to light your spaces with the soft ambiance from candles and lamps that are on dimmers. And softly scented floral candles do wonders to make your home smell like spring too! Thank you for stopping by and seeing my boho farmhouse spring home! 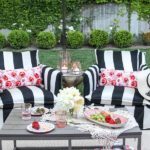 I hope it gave you some fun spring decorating ideas for your own space. 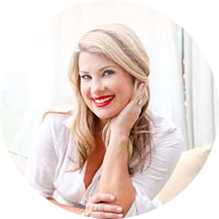 Next up on this Seasonal Simplicity Spring Home Tour is Taryn Whiteaker. I always love seeing how she decorates for each season. Go take a peek! So pretty! I love your door greeter and your new floors look amazing!! I love everything, Ashley! 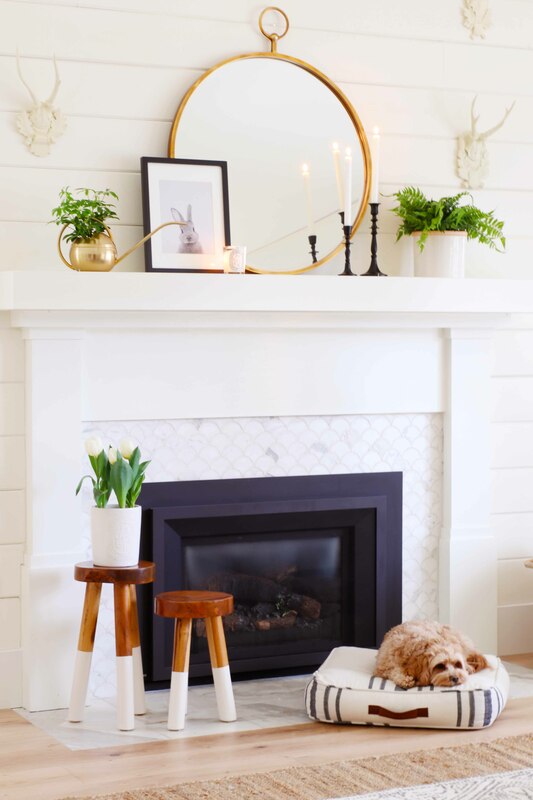 Your new floors are stunning, and so is that wallpaper and your lamp… and of course I love that mantel design and tablescape! Great tour – glad you could be part of this series! AH! That wallpaper, Ashley, is gorgeous! Your home is beautiful.